To be used for therapeutic purposes Instant Cold Packs must be certified as Class IIa medical devices and accredited to ISO9001: 2016 and ISO13485: 2016, as required by the Medicines & Healthcare products Regulatory Agency (MHRA). 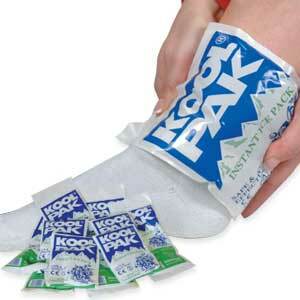 The Koolpak instant ice pack gives you the power to treat muscular strains, bumps and scrapes no matter where you are. Injuries can occur in many places and situations where a frozen bag of peas isn’t on hand to provide relief, and Instant Ice Packs are the solution to this problem. Cold therapy works by reducing blood flow to the injured area, which significantly reduces swelling and inflammation that causes pain, especially around joints and tendons. The cold also helps reduce nerve activity further relieving pain and discomfort. To be used for therapeutic purposes, Instant Cold Packs MUST be certified as Class IIa medical devices and accredited to ISO9001:2016 and ISO13485:2016 as required by the MHRA. 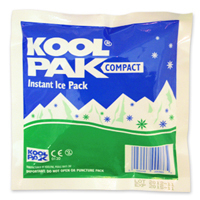 Koolpak Instant Ice Packs are fully compliant with the Medical Devices Directive unlike many other products on the market. 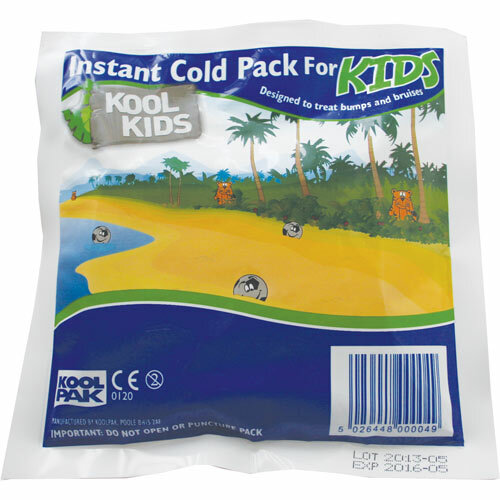 If an Instant Cold Pack does not show a CE Mark and authority number then it is NOT suitable for medical or therapeutic use. How Should I Use Instant Ice Packs? You should use cold therapy for short periods of time, several times a day. Ice packs should not be used over a prolonged period to prevent nerve, tissue or skin damage that may result from over-use. To help reduce swelling even further, try and elevate the affected area for better results. Ice Packs are a great temporary solution for injuries and are ideal for reducing initial pain and swelling. Ice Packs are extremely versatile in their applications for treatment in First Aid. Many of the most common workplace hazards benefit from the treatment of Cold Therapy, making Ice Packs ideal as an additional first aid supply to existing first aid kits. Cold Therapy works to reduce inflammation around the area of injury and can also work to numb the area of pain, creating an analgesic effect. Help your First Aiders give effective treatment and improve the comfort of the injured by ensuring there is always an Ice Pack to hand. The PRICE treatment comprises of a method for treatment of soft tissue injuries, used both immediately following the incident of injury and during the ongoing injury management process. Correct application of PRICE has been recognised to prevent further injury or complications, relieve pain, limit swelling and accelerate the healing process by days or even months. Protect the injured person but also protect yourself. Protect the area being treated with a splint if possible and if safe to do so, carefully move them to a safer area using a stretcher or a crutch. Rest is an important step immediately following the injury to reduce blood flow to the injury site and help prevent any further damage from developing. Ice application to the injury is a vital step to reducing swelling and pain. A Cold Pack should be applied as soon as possible after the injury occurs. It is recommended to apply an Ice Pack for 20 minutes every 2 hours for the first 48 – 72 hours. Compression brings two benefits, the first being the reduction in localised bleeding and swelling, and the second is support of the injured area. This can be achieved by using a suitable Bandage which fully covers the injury and overlaps the surrounding area. Elevation simply involves raising the injured area above the level of the heart to further reduce bleeding and swelling. Ensure the patient is completely comfortable and do not elevate an injured area if this causes excessive pain. I bought these because my chiropractor wants me to regularly use ice-packs and I don't have a freezer. They are a good size to cover the area I need and work well. I have had a couple out of about 30 used so far that didn't work but that's not a big deal at the price. Ice packs - pretty straight forward! Have used them before and know the quality to be good. these were bought to provide quick relief for knocks during a football match. no issue in breaking the bubble in the pack to trigger the cold. all have worked so far with no issues and would purchase again. excellent product - quick and easy to use. We have bought these for the first time, although have not used one yet. As a childcare setting, we like to go out on trips and, as head bumps naturally occur with children, these are useful to have just in case. 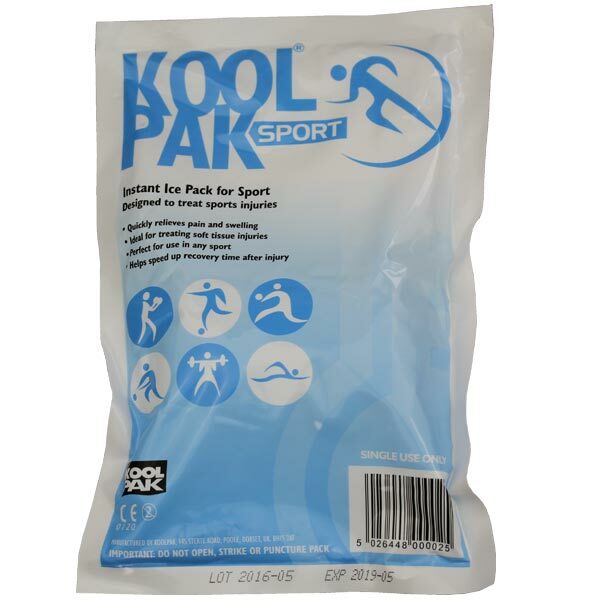 The cool packs are used for a bad knee, therefore would suit someone with sports injury etc. We run a mobile skatepark. The kids get grazes. The ice packs are good. Product does what is expected.